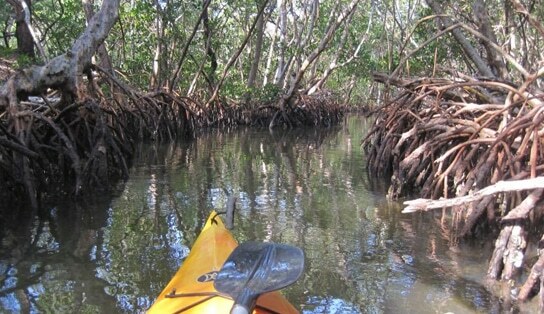 Safely Kayaking Mangrove Tunnels could be challenging if the paddler on a kayak tour is not very experienced. Many visitors to Sarasota and Siesta Key and Longboat Keys, come to South Lido to kayak for the first time. Because Sarasota Bay is shallow and everyone can see the bottom most of the time; it isn’t as intimidating as say, paddling with alligators at Myakka State Park, would be. There’s nothing in the water or in the mangrove tunnels that is known to bother anyone even if they are not fully comfortable in the super natural ecosystem of the mangrove tunnels. Mangrove crabs which are plentiful throughout the forest and cling to the roots and limbs of the mangrove trees, are somewhat creepy looking to a lot of people but are entirely harmless. These crabs are often seen too close up by paddlers who bump around paddling through the tight areas of mangrove root tangles where the crabs are readily seen. The crabs don’t scamper around or move fast but crawl along the limbs and roots obliviously scarfing the algae that is exposed on the roots at low tide. The tide is especially important in how each tour is conducted and experienced. At low tide, many of the entries to the mangrove tunnels are shallow that entering and exiting are not possible except by portage and this practice is not good for the sensitive bay bottom in this highly trafficked environment. The best tours are done when the tide isn’t moving especially fast but is not either extremely low. If not for low growing limbs which sometimes drop across the passages; a higher tide can be very forgiving for the novice or beginner paddler because the tunnel area becomes wider on a flood tide. On low tide, paddles don’t fit between the tangled roots of the trees that line the narrow canals and it isn’t as easy to navigate as on a higher tide when the boat floats higher and the roots are lower than the kayak. Not every day has a tide that is perfect for paddling but we choose the best time of day and also consider the schedule and adventurous nature of the participants when deciding when to go. Faster moving tides can be fun and interesting for many trips but both ways present special challenges that your guide will give you tips on handling easily. Your guide is trained to provide you with a safe and pleasant experience when you participate in a mangrove tunnel tour on South Lido. We know how to make paddling easy and fun and to keep the difficulty to a minimum whether it’s paddling the kayak or getting in and out of it with ease and maybe even grace. Not everyone has the same ability to squat, stretch and bend and getting sat down in a kayak is easiest when you lower yourself into the seat. One foot in the kayak is a sure way to make it slide away from you and this often results in the paddler losing balance and even falling down. We don’t leave you to figure it out and we will show you how to enter and exit the kayak in the best and easiest way for you. Most paddlers don’t turn over when they go on a kayak tour at Ted Sperling Park. It is possible however, that if a person leans too far out of the center of the boat that they can capsize. The kayaks that we use for tours are chosen because they are more stable, controllable and comfortable than many kayaks that you will see on the water. We use sit inside kayaks as much as possible because they are less apt to tip over because the paddler sits lower to the water and is not “on top” of a double walled hull. Although sit on top kayaks are much easier to hose off than sit inside kayaks which must be overturned and sponged out after use; we have found it to be worth the extra trouble to provide kayaks for the mangrove tunnel tours that are less vulnerable to overturning. PFD’s or commonly called : life jackets, are standard issue with every kayak excursion. At Ted Sperling Park on South Lido and at Jim Neville Preserve on Siesta Key, PFD’s are not generally required to be worn by all participants. Every paddler is given a PFD that is carried on the kayak he or she is in, and that jacket is fitted to the paddler before the kayak tour or rental begins. If a PFD is properly fitted and worn, or carried and at the ready in case of a need for it; it must be properly fitted to be of reliable capability to assist the paddler in staying afloat if they should fall out of the kayak. Most of the time if a person fell out of a kayak on the Mangrove Tunnel Tour, they could just stand right up and be in water less than hip to knee deep. Sometimes, we are in deeper water when an overturning occurs. This is very uncommon and the incident is handled by the guide who first empties the kayak and then assists the paddler in reentering the kayak from the water or assists them in making their way to shallow water where a reentry is easier. Best practice is to keep your head over the middle of the boat and you won’t fall out! We provide the opportunity for our guests to get a hands on experience as they explore and learn about Sarasota Florida’s amazing coastal ecosystems and its inhabitants. We will set out to enjoy the tranquil serenity and while doing so, we will be on the lookout for various species of birds, Dolphin and other marine life that they call their home. Copyright © 2018 Island Style Watersports, | All Rights Reserved.